Lebron James is expected to return for the Lakers when LA travels to Indiana to take on the Pacers on Tuesday night. The Pacers (34-19, 18-7 home) are 2-4 since losing star man Oladipo due to season ending injury, but the hosts did win their last two games – including a victory in New Orleans last night. The Pacers weren`t that impressive in New Orleans though, almost blowing a double digit deficit in the fourth quarter, eventually winning by 2 points. It was close at the end, and the Pacers needed a bit of luck to edge it. The Lakers (27-26, 11-14 away) fell out of the playoff picture after Lebron missed 17 games due to injury, but they are still close, and are expected to eventually make it. 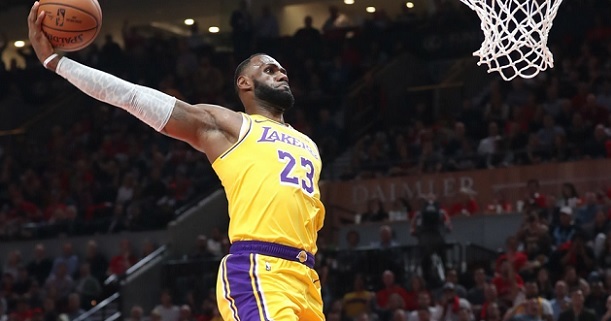 Lebron returned two games ago and led the Lakers to a big win against rivals Clippers, but sat out again the next game in a loss against the Warriors. Now, he is expected to return tonight against the Pacers, and start playing again on a consistent basis. Bet on Pacers v Lakers and get your 100% (120 Eur) welcome bonus at LSbet now! Team news: The Pacers will be without Oladipo and possibly McDermott. The Lakers have Chandler, Hart and Ball questionable, while Kuzma, James and Zubac are listed as probable and highly expected to play. The Pacers are a good, deep team, and they will remain a dangerous opponent even without Victor Oladipo. However, his absence is sure to be felt, especially against the better teams. Since he`s been out, the Pacers have not played that well, and that was also the case last night in New Orleans – despite the win. The Pacers will have less than 24 hours to travel almost 800 miles from New Orleans to Indiana and prepare for this game, which is far from ideal. The back to back situation will be a problem for Indy, especially since last night`s match was close and required a lot of energy (the starters played between 31 and 35 minutes each). The Lakers have been decent without Lebron, and with Lebron they are obviously a different team, one of the best in the league. They should be able to take advantage of Indiana`s fatigue and the absence of Oladipo. If Lebron ends up not playing it will be a big problem for the bet, but he is highly expected to play, and we can only go by the reports. He should be ready, and Kuzma and Zubac should be as well. If these three suit up as expected, odds will drop on the Lakers. My tip here will be LA to win. Prediction: Indiana Pacers – LA Lakers 107 – 114.